Browse: Home / killchain v0.2 ~ A unified console to perform the “kill chain” stages of attacks. Changelog v0.2 : killchain.py; IPTables rules. 1) Anonymizer — Load Tor Iptables rules, route all traffic thru Tor. 2) De-Anonymizer — Flush Tor Iptables rules set to default rules. 3) Set — Social-Engineer Toolkit (SET), attacks against humans. 4) OpenVas — Vulnerability scanning and vulnerability management. 5) Veil-Evasion — Generate metasploit payloads bypass anti-virus. 6) Websploit Framework — WebSploit Advanced MITM Framework. 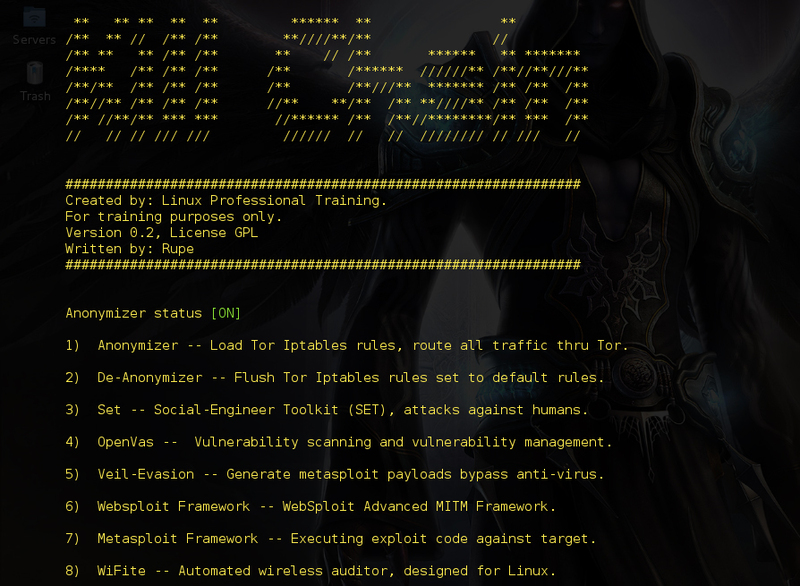 7) Metasploit Framework — Executing exploit code against target. 8) WiFite — Automated wireless auditor, designed for Linux. ← Crawlic is a web reconnaissance tool.